TS DEECET 2018 is the Common Entrance Test conducted to grant admissions to the aspirants who desires to join in District Institutes of Education and Training (Diet cet 2018/DEECET 2018) or Elementary Teacher Training Institutes Common Entrance Test(ttc 2018).TS D.Ed (TTC) Exam 2018 Notification released in the month of March 2018. This Telangana State DEIT CET Notification is for students to rovideadmissions in TTC Course for the academic year 2018-19 through Department of School Education. The Government of Telangana publishes the TS DEECET Notification 2018 for the common entrance exam to get Admission for D.Ed with Two years Duration Course. Director of School Education in Telangana will release DIETCET Notification in April 2018. Willing candidates can check the TS DEECET 2018 Notification details such as Online Application Process, Eligibility, Important dates. Interested applicants can apply for the Telangana D.Ed (TTC) exam on Online Application Mode. Candidates must submit the Telangana DEITCET Online Applications on or before the last date . The DEECET Notification is for District Institutes of Education and Training (DIET) and Private D.Ed Colleges. Aspirants who are eagerly waiting to join in Diploma Education course in Telangana Institutes may apply for this Telangana DIETCET 2017 Exam. One can apply through Online on or before the Last Date Online applications available from 21-04-2018 to 10-05-2018 at the official website. The Candidates applying for TS DEECET 2018 Exam should satisfy the below DIETCET eligibility criteria such as educational qualification and Age limit. The eligibility details given on our website is based on the Eligibility criteria according to the TS DEECET 2018 Notification. The candidates who have passed the Intermediate (10+2) or its equivalent with minimum 50% marks are eligible to take the TS DEECET 2018 entrance exam. The Aspirants who appeared for 2nd-year Inter examination can also apply for TS DEECET 2018 Exam, but they should be passed at the time of admission to the course. Applicants need to satisfy the minimum eligibility criteria for TS DIETCET 2018 such as qualification, age limit, etc. 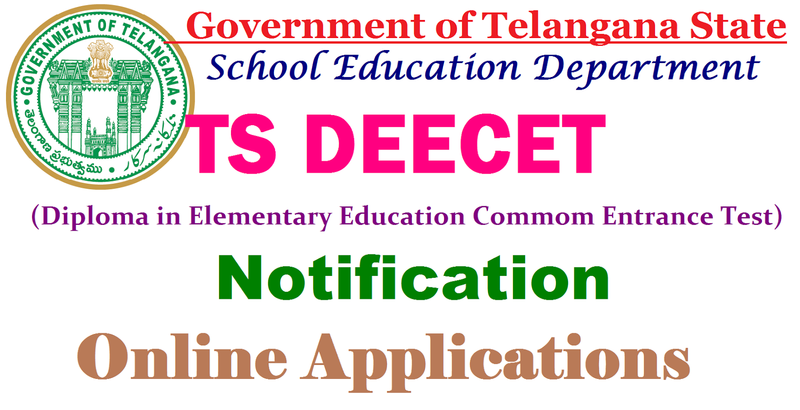 Eligible candidates can apply for Telangana Deecet Exam 2018 before the closing date. We have provided here the simple steps for the candidates to download and submit the online application form. Last date for submission of application through online . రాష్ట్రంలోని ప్రభుత్వ/ప్రైవేట్ అన్ ఎయిడెడ్ ఎలిమెంటరీ టీచర్ ఎడ్యుకేషన్ ఇన్‌స్టిట్యూషన్స్ (మైనార్టీ, నాన్ మైనార్టీ)ల్లో ప్రవేశాల కోసం నిర్వహించే డీఈఈసెట్, డీఎల్‌ఈడీ నోటిఫికేషన్లు పాఠశాల విద్యాకమిషనర్, సంచాలకుల కార్యాలయం విడుదల చేసింది. -డిప్లొమా ఇన్ ఎలిమెంటరీ ఎడ్యుకేషన్ కామన్ ఎంట్రెన్స్ టెస్ట్- 2018 ద్వారా డైట్‌లలో, డిప్లొమా ఇన్ ప్రీస్కూల్ ఎడ్యుకేషన్ ద్వారా ఎలిమెంటరీ టీచర్ ట్రెయినింగ్ సెంటర్లలో ప్రవేశాలు కల్పిస్తారు. -ఈసారి డైట్‌సెట్‌ను ఆన్‌లైన్ విధానంలో నిర్వహిస్తున్నారు. -ఆన్‌లైన్‌లో దరఖాస్తు దాఖలు చేయడానికి చివరితేదీ మే 10. -అర్హతలు, పరీక్ష విధానం, సిలబస్, ఇతర వివరాల కోసం వెబ్‌సైట్ deecet.cdse.telangana.gov.in లో చూడవచ్చు. when is with fine last date for the application sir..